Another Long Walk: Holy Naked Fisherman in a Rowboat! footprints! That amused me for hours! 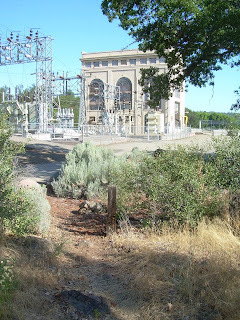 July 27: I woke, broke down camp, and followed the trail off of Hat Creek Rim and back into the rugged, hilly terrain. A few hours later, I reached the first water source on the trail in over 30 miles, and I was ready to reload my containers. At least until I got to the water source. Rock Spring Creek flowed through a small valley populated with civilization, and the ground around it looked like it had been trampled extensively, either from cows or perhaps hikers who invariably camped there due to the lack of water on the trail. In fact, I originally planned to camp at this point until I stopped early on Hat Creek Rim because I enjoyed the views from there so much. And I looked at the water and thought, "Yuck." I didn't want the water. Keep in mind, I generally don't treat my water at all, so I'm rather particular about selecting surface water for drinking. I did carry some tablets I could drop in water that would make water safe for drinking--allegedly--but I only use those as a last resort. I'd rather drink good (untreated) water than bad (but treated) water. I wasn't sure if I still had enough water to get me to the next good source, which I suspected would be tap water somewhere at Burney Falls. So I filled up my Nalgene bottle, dropped in a tablet, and hoped I'd find good water before I'd be forced to drink from it. A little ways beyond that, I reached Baum Lake. 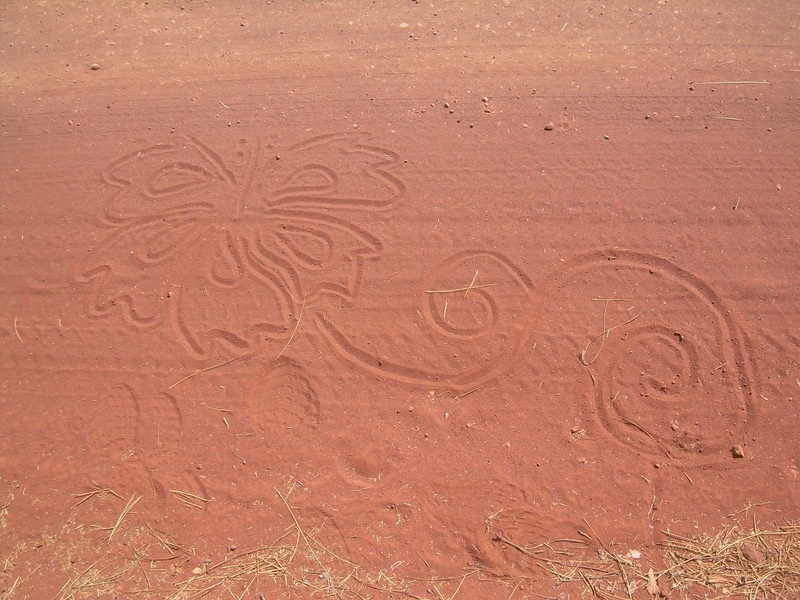 People were everywhere--civilization everywhere as well. Water fed into a fishery and a powerhouse, and where the trail crossed on a bridge, a dozen boats with fishermen were plying their trade, and a dozen more along the shore did the same. I followed the trail along the edge of the lake, eventually missing a turn back into the woods and followed the shoreline to the far side of the lake where it was empty of people.... except one older gentleman, shirtless, rowing away in his rowboat. I didn't think too much of him--I was already starting to wonder if I had missed the turn for the PCT--until I saw him stop rowing and stand up, casting out a fishing line. He was quite a distance away, but I couldn't help thinking, "That man looks like he's naked!" I couldn't be certain, though. He was so far away, and maybe he had on a skimpy or flesh-colored swimsuit? My monocular would have been the perfect thing to use to verify if I was seeing what I thought I was seeing, but it was missing. I had it when Amanda came out to visit and we were in Quincy, but when we changed hotels, I'd never seen the monocular again. Did it get left behind in the hotel room? Did Amanda pack it away in her stuff by accident and take it home? I don't know, except that I didn't have a monocular to verify if I had really stumbled upon a naked fisherman. I backtracked to where I lost the trail and continued hiking, and about a mile later, my camera stopped working. I'd turn it on, and it would make noise, the lens would open, but nothing showed up on the screen. It's as if the optic nerve had been separated. Damn! My camera went blind taking a photo of a naked fisherman! It was too much pressure for the camera! Actually, my camera had been acting up for a couple of weeks now, and I'd been contemplating replacing it. It had had this problem before, so I'd click the power off button, power it on again, and presto, it would start working again. I did the 'reboot' a few times, but the camera failed to work. I turned it off for five minutes, hiked a bit, then tried turning it on again. No dice. I knocked the camera around in the hopes of jarring it back to functionality, but nothing. Is he fishing naked? You decide! After an hour of this, I started to worry. I needed photos! I pulled out my Peek device and e-mailed Amanda about the problem, and if there was anywhere nearby I could get off the trail to buy a new camera. The closest town now was Burney (the city, not to be confused with Burney Falls which the trail also passes), but it was a small down and seemed unlikely to have anywhere to buy a decent camera. So I e-mailed Amanda asking about other options as well further up the trail: Dunsmuir, Mount Shasta City, and even Redding as a worst-case scenario. Or maybe I could have Amanda put in an order for me and have a camera sent to the next trail name? I needed options! I needed a camera! At the very least, I hoped I could acquire a disposable camera at the Burney Falls general store. I sent the e-mail off, and continued hiking. One really nice thing about the trail since leaving Old Station, I've been able to send and receive e-mail almost the entire way. My cell phone didn't work, but my e-mail did. Just before reaching Burney Falls, the trail went by a camp specifically intended for PCT hikers. It was a wonderful little campsite with running water, primitive (but clean!) restrooms, and a table with a sign saying that the food and drinks in the ice chest were for thru-hikers and to help ourselves. Awesome! I drank a soda, then went into the outhouse to do my business--always nice when they're available. And what did I find next to the toilet? Wait--don't guess. It's not that. No, it was a digital Weight Watchers scale. I knew it was a WW scale because it had the WW logo right there on the scale. It's a pretty fancy scale, and a bizarre thing to find sitting next to a pit toilet. was the last photo I took before my camera pooped out. And, how much did I weight anyhow? I last tried weighing myself back in Agua Dulce on a scale that I was told was off by five pounds. So I tried weighing myself on this scale: 161.4 pounds. I started at about 180 pounds--I'd lost almost 20 pounds since I started. Yep, that's what I was guessing. Outside, I dumped out the water I picked up from Rock Spring Creek--having not taken so much as a sip of that nasty stuff--and filled it up with water from a spigot. Rising the Nalgene bottle first to get any residue water from Rock Spring Creek out. Then I pushed on to Burney Falls. 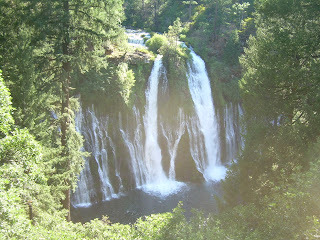 At Burney Falls, a few hikers were there that I didn't recognize, and one that I did: Hurricane. It was always fun crossing paths with Hurricane. 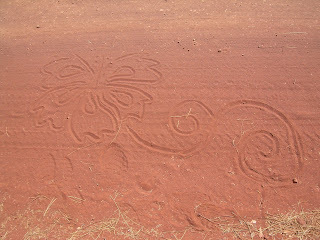 I'd seen him more consistently than any other hiker along the length of the trail. I went inside the general store where I bought an ice cream sandwich, two hot dogs, and a quart of milk for lunch. Mmmm..... When I got back outside, The Graduate had also arrived. Hurricane was complaining that he didn't feel 'motivated' to hike anymore. "And do you know why you don't feel motivated to hike?" I asked him, after swallowing a bite from my hot dog. He shrugged and said, "No, why?" "Because you don't like hiking!" 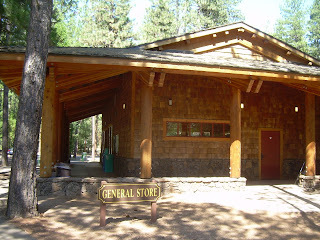 The general store at Burney Falls SP. The Graduate choked on a laugh, and I continued on. "I'd feel pretty unmotivated too if I didn't like hiking!" It still amused me that Hurricane would fly halfway around the world to do something for six months that he simply didn't enjoy. The conversation drifted onto other topics, including what next big trail we all might be inclined to do someday, and I loved Hurricane's response: "If I were to do another long distance hike," he said, "WHICH I WON'T," he emphasized, "but if I did... it would be the Colorado Trail." I was amused at how strongly he emphasized the fact that he would never do another long distance hike again, but also surprised at his choice of trails. 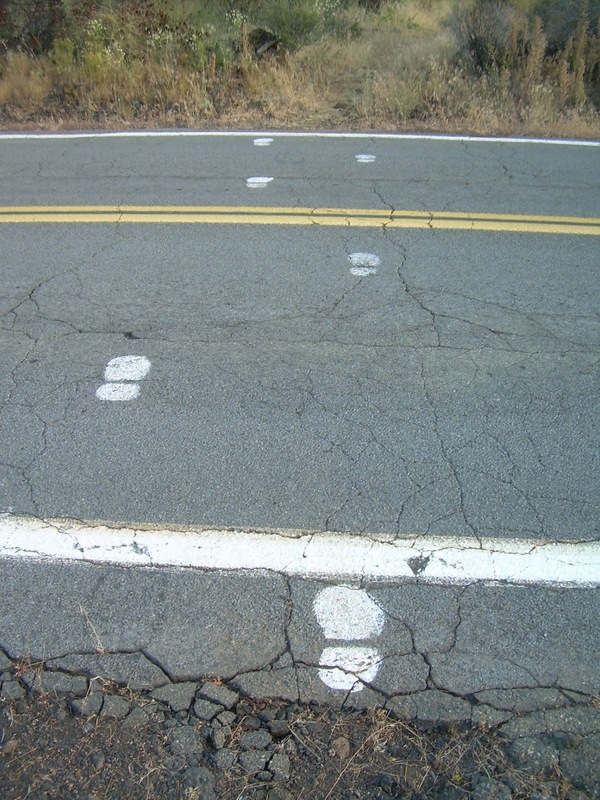 "The Colorado Trail?" I asked. "Why not something in New Zealand? I always heard that New Zealand had amazing trails and scenery. Why not something in your home country?" And he said it was just more interesting to go somewhere "exotic" and "foreign." New Zealand was his home and I guess lost some of it's interest as a result. I guess I could understand. I was kind of growing bored of the PCT at this point. Hiking in New Zealand sounded very appealing to me right then. but the lighting was terrible! I called Amanda from a payphone where she told me she had gotten my e-mail and had already gone out, bought a new camera at a local store in Seattle, and had it shipped priority mail to the post office in Dunsmuir. Wow! She was efficient! It also gave me a schedule: I had to get into Dunsmuir by the time the post office closed on Friday, or I'd have to wait until Monday morning when it opened again. To arrive by Friday, I had to arrive about 30 miles per day. "I'll shoot for Friday," I told Amanda. "I don't know if I'll make it, but by golly, I'm going to try." I had yet to do a single 30 mile day on the trail, and now I was committing to averaging 30 miles per day. I wanted to get this trail done with anyhow. I went back into the general store and bought some more stuff--snacks for the trail, and three disposable cameras to get me through to Dunsmuir. Probably more than I needed, but I felt it was better to have too many cameras than not enough. And when I left the general store and headed back to the trail, I was carrying four (four!) cameras. How sick is that? Three disposable cameras, and one broken one. I kept the broken one, just in case it miraculously started working. Which it did--about five minutes after I bought the three disposable cameras. Figures! I walked over to the viewpoint for Burney Falls, where 100 million gallons of water seeps out of the ground each day then flows a few miles over a wide ledge forming the falls. The falls were nice, but the angle of the light was terrible. I could a couple of photos knowing they would look horrid. The falls were nice, but the fact that amazed me the most was that the falls were fed completely from spring water coming directly out of the ground. That's a heck of a big spring! Obstacles, always a new challenge around every corner! 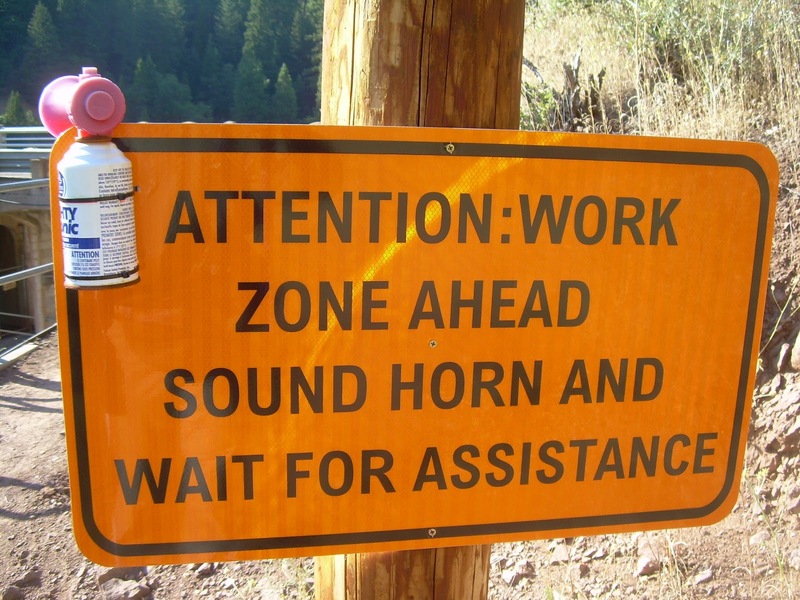 I hiked onward, stopping briefly where a sign told me to punch a horn and wait for construction crews to give me the okay that it was safe to cross. The trail crossed Lake Britton Dam where construction crews were installing a new powerhouse. 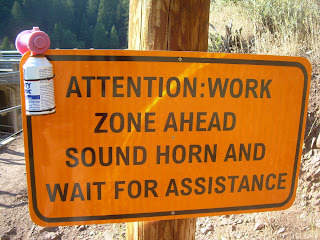 I punched the horn which let out a deafening screech, then looked to the far side of the dam to see what my mayhem had accomplished. 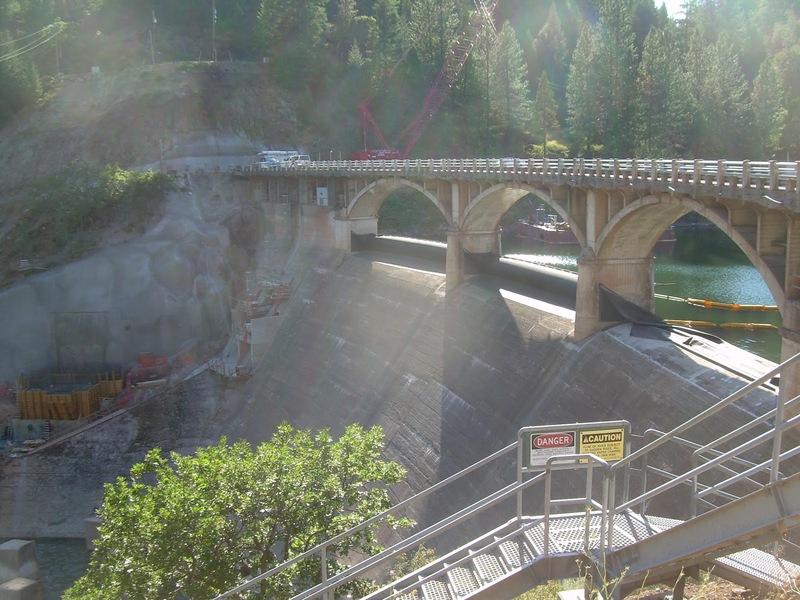 It looked like every construction worker over there was looking in my direction now, and one of them started walking towards my side of the dam and waving his arm signaling me to go ahead. But I continued on again. While stocking up with water at Rock Creek, I slipped on a rock and fell in. Argh! My camera, which I kept in my shirt pocket, fell out into the water. It might have bothered me more if it was actually working reliably and I didn't have three spare disposable cameras in my pack already. But now all my clothes were wet, my camera was wet, and I couldn't believe I slipped and fell into the creek. Argh! crosses over the top of the dam. I pushed onward and upward, climbing in elevation, eventually setting up camp directly on the trail near a heavily logged section of trail. The ground around the trail was tore up with tractor tracks, branches and debris sticking out everywhere, and the tread of the trail actually looked like the most comfortable place to set up camp, so that's what I did. Oh Ryan... sure, now that we cannot enlarge your photos, you are now asking us for what is going on in the picture.... and here Wassa has another lost opportunity to get rich fast with Eye Bleach! I actually *already* enlarged that photo as large as I could. Enlarging it anymore than that just makes it blurrier. Unfortunately I was able to zoom to 400% It didn't really fill the screen mind you, but that old dude looks nakey. I mean the sun is shining off of the place where the sun don't normally shine but the moon glows...ya know. Eww. Wonder if a nudist colony is nearby? P.S. It's so weird to me that you are 'living in July" when we know you are back! Yep, naked as a jay bird. This hike seems like a fun hike with so many little towns and refreshments all along the way. What was the longest you had to go, carrying your own food and preparing meals without stopping for supplies? I once hiked for 13 days, and carried all the food I needed. Y'know, you could have looked at that photo right there and then. I haven't seen a digital camera yet that didn't have a zoom and pan feature to use while viewing the pictures you've taken. You could have zoomed right in on that particular part of the photo and seen how much detail you had captured. 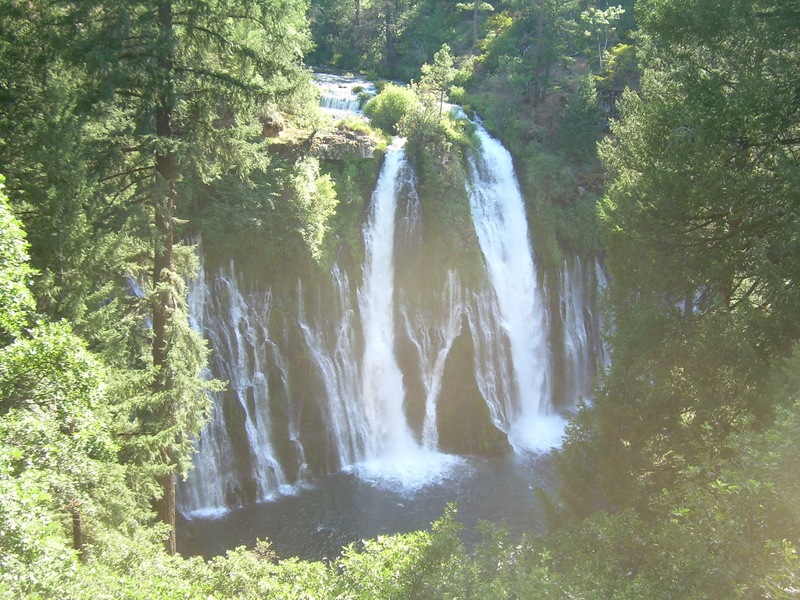 Burney Falls!? Did you stop for my letterbox? The Northerner snagged it when he was on his PCT thru hike way back when.